Convert HTML To Image: JPG, JPEG, GIF, BMP, PNG, WMF, EMF and TIFF with Html Snapshot ActiveX! Free download and trial! Do you ever want to take a screen shot of a web page in your desktop or web application? Html Snapshot can capture the whole web page as JPG, BMP, PNG, TIFF and GIF image on the fly. Add "Html to image" or "html to jpg" feature to your application now! HTML Snapshot ActiveX can download and parse web sites and save a screenshot of the page in GIF, JPG, JPEG, BMP, PNG, TIFF, WMF and EMF. You can choose to capture the entire page, or a thumbnail image of a specified size, and save it to a local folder. Not only html files, the plain text files as well as the Web Archive Format (*.MHT) files can be converted to image with HTML Snapshot easily, too. HTML Snapshot can allow you to batch process URLs from a text file and automatically parse a large number of sites. HTML Snapshot is a standard COM DLL server, allowing you to generate a thumbnail via query string from your web browser. This is one of the best HTML to image converters. HTML Snapshot can capture web pages with flash movie without problem. 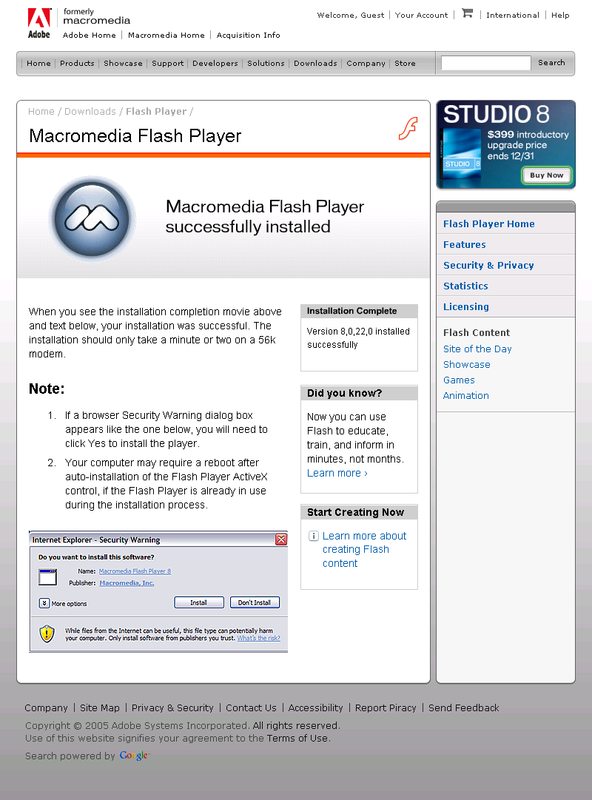 Check out the snapshot of macromedia.com. Get interested? Free Download & Try Now . No functionality limitation except watermarks in the generated image for the unregistered version. Buy Now. Remove the watermarks. $149.95 For Single Developer License. $299.95 For Developer Team License. You may want to control the compression quality of JPEG or change the compression method of TIFF image. No worry. Html Snapshot has done these for you. For TIFF, you can easily get images ready for Windows FAX Service. With Html Snapshot, you can build thumbshot server for millions of web pages easily. You have full control of the database yourself. And Html Snapshot is especially suitable to be used on server side. It works well on Windows 2000 Server, Windows 2003 Server and can be used with popular server side script languages like ASP, ASP.Net, PHP and Perl etc. No need to pay monthly subscription fee for thumbshot service providers now! Html Snapshot can convert the VML - the Vector Markup Language to image. VML markup can be embeded in html files so it can be converted just like "html to jpg". Here is the snapshot of this page captured by HTML Snapshot. If you are looking for the programs, such as convert html to image, html image, html2image, html to image, htm2img, htm to img, html2gif, html to gif, html2jpg, html to jpg, html2jpeg, html to jpeg, html2bmp, html to bmp, html2png, html to png, html2tiff, html to tiff, software to convert html to image, this is the best of all. HTML Snapshot works with all Windows version with Internet Explorer 5.0 or above and with Internet Connection. It is a program without any hassle to install. Just save it to your desktop and run our demos. Sometimes, you may want to convert 24 bit color bitmap file to gif file, which only supports 256 colors. Html Snapshot provides function to effectively reduce the color in image while keeping the quality of the image as much as possible. My fellow programmers, don't spend your precious time to reinvent the wheel now. Get Html Snapshot for ONLY $149.95 NOW! Then you can easily add the "Html to jpeg" function to your web or desktop applications. You can call it from your favorite development tools. Many working examples are supplied. Just have a look at them, you will find html snapshot is so easy to use. News: Html Snapshot is upgraded to 2.1. This version adds a bunch of new methods for advanced usage. News: Html2image for linux is released. You can convert html to image easily on your linux servers. This component is convenient for use with good price and compact size for html to image and html to jpg functionalties. Nice features - we can script on the fly to convert html to image. And it handles multiple image types, etc. This is the only software we could find that currently does this html to jpeg conversion, plus we can script it. But if you're still not sure, try it out for FREE in your applications to convert html to image NOW. We have also posted a series of tutorial articles to help you use html snapshot. Feel free to read it. Examples in VC, Delphi, VB, VB.Net, C#, ASP, ASP.Net, PHP, Perl, Python, Cold Fusion, PowerBuilder, FoxPro, Windev, VB and Java script as well as Java are provided. Windows Platform, Internet Explorer 5 above, Internet connection, High color display mode. strUrl: The URL of the web page to be taken snapshot. strPicFile: The local image file to be saved. It should be a valid file name. For example, c:\1.jpg or c:\1.bmp etc. Currently the component supports jpg, bmp, gif, tiff and png format. It will convert html to image in the format given by the file extension. You can get the bitmap handle in memory when the html is successfully converted to image. strPicFile: The local image file to be saved. cx, cy : The dimension of the thumbnail image. bRemainRatio: If bRemainRation is 0, the thumbnail image will be exactly the size of cx, cy; else then remain the original image's aspect ratio. Description: Reduce the color number in input image. nColors is in [8-256]. Description: convert a color image to gray or black white only. If bGrayOrBW = 0 then, the result image is black white only, else it is gray. strCode : Set the registration code to eliminate the limitation in trial version. nDelayTime: The time value in milliseconds to wait after a html document is downloaded. Sometimes, a page contains ActiveX like flash, which takes some time to initialize. This method can be used to control the timing to capture the content of the dynamic embeded objects. Default nDelayTime value is 1000.
bAsync : If set to True, SnapUrl function will work asynchronously, which means it will return immediately without waiting for the results. Application can use the event to determine if the operation is done. If set to False, SnapUrl will wait until the operation is done or the time is out. Description: Set the width and height of the web browser window. The browser window size will affect the html document size in some way. Description: Force the captured image size to be the dimension set by SetSnapDimension. If the dimension is larger than that of the html document, the gap will be filled with background color of the page. The default value is FALSE. Description: Set the data to be posted to the URL. Use this function for some urls protected by forms. Description: Set the compression method of TIFF image. 0: LZW; 1: CCITT3; 2:CCITT4; 3: RLE; 5: None. Description: Set the threshold value (0-255) when converting image to monochrome.